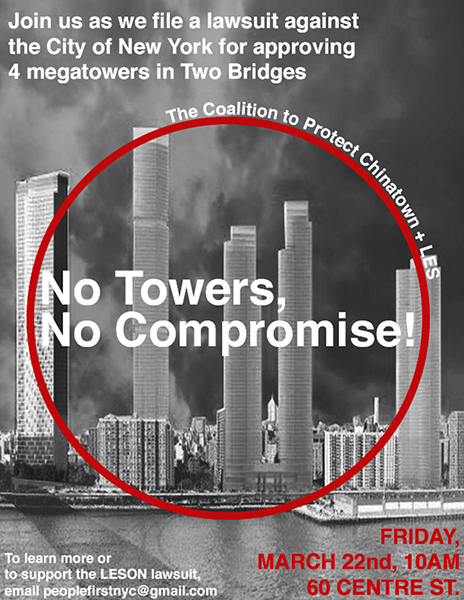 Today, AALDEF filed a lawsuit in New York State Supreme Court to challenge the City’s approval of four luxury megatowers in the Two Bridges neighborhood of Lower Manhattan. If allowed to stand, the approval would bring enormous change to the neighborhood. These towers would add over 2.5 million estimated gross square feet of space and triple the density of the neighborhood by almost 3,000 new units. Further, they would cause one of the buildings to increase from approximately 27 stories to over 80 stories—an increase of 53 stories to the currently tallest standing building in Two Bridges. The suit, Lower East Side Organized Neighbors v. The New York City Planning Commission, was brought on behalf of Lower East Side Organized Neighbors (LESON), National Mobilization Against Sweatshops (NMASS), Youth Against Displacement (YAD), Chinese Staff and Workers’ Association (CSWA), and residents of Manhattan’s Lower East Side. The lawsuit asserts that the developers’ plans for out-of-scale towers violate the NYC Zoning Resolution, violate City Environmental Quality Review procedures, ignore underlying restrictive deeds on one of the properties, and run counter to the Department of City Planning’s proposal to crack down on “mechanical voids”—the use of a building’s empty space to store mechanical equipment as a way to boost the height of residential buildings. The proposed towers are located at 247 Cherry Street, 260 South Street, and 259 Clinton Street.